Earlier this week, I was in Chicago, Illinois for the Association of Proposal Management Professionals Bid & Proposal Con. The conference provided breakfast most mornings, but it hadn't gotten underway on Monday morning yet, so I ventured out into Chicago to eat. My breakfast place of choice was the Lake Street location of the Billy Goat Tavern. If the name doesn't ring a bell, perhaps you're familiar with its TV parody, the Olympia Café. And if you're not familiar with the Olympia Café...well, I guess you're young or something. Female Customer: I'll have a tuna salad sandwich, and an order of French fries, please. Pete Dionasopolis: No. No tuna. Female Customer: You're out of tuna? Pete Dionasopolis: No tuna. Cheeseburger? Come on, come on, come on! I don't have all day, we gotta have turnover, turnover. [ turns to Male Customer ] What are you gonna have? Male Customer: Uh.. I think I'll have grilled cheese and a Coke. Pete Dionasopolis: Uh.. [ turns to kitchen ] Grilled cheese? George Dionasopolis: No grilled cheese. Male Customer: No grilled cheese. Male Customer: Uh.. cheeseburger and a Coke. Pete Dionasopolis: Uh, no Coke - Pepsi. Male Customer: Okay, uh.. Pepsi, and french fries. Pete Dionasopolis: No fries - chips. Pete Dionasopolis: [ to kitchen ] One cheeseburger, one Pepsi, one chip! Pete Dionasopolis: [ to Female Customer ] What do you want? Female Customer: I'll have a cheeseburger and a small Coke. Pete Dionasopolis: Uh.. no Coke - Pepsi. Pete Dionasopolis: [ to kitchen ] One cheeseburger, one Pepsi! 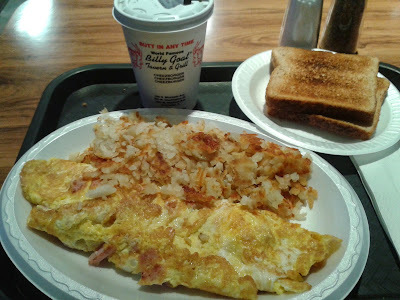 I was planning on visiting the real Billy Goat Tavern (or at least one of its many locations) during my visit to Chicago, but when I heard of a chance of rain on Monday afternoon, and since I needed to find a breakfast place anyway, I figured I'd go there Monday morning. Of course, since it was 6:00 in the morning, I didn't go for the cheeseburger. The ham & cheese omelet that I got was basic, but it was better than hotel food.